Chakra is a Sanskrit word meaning wheel or vortex. Chakras are our energy or power centres that are located at various places alongside the spinal column. These places are known as portals and it is though theses portals that the life giving Universal energy/ White Light flows and is transformed into a usable form that the body can utilize. 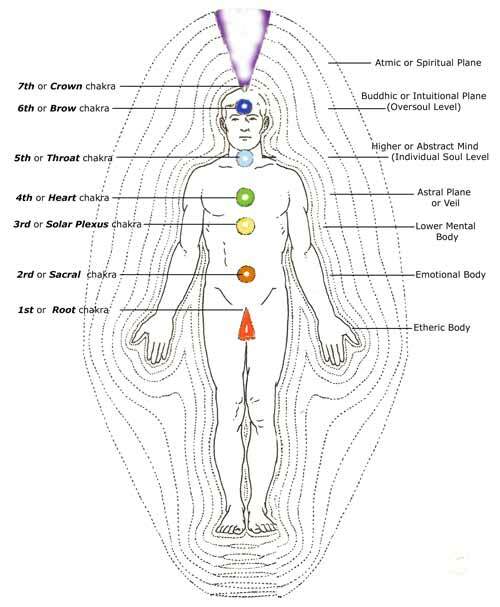 Chakras are not found in the physical body but exist in the etheric body of our aura. We have seven main chakras and lesser ones located in the palms, feet and ears. Energy flows in and out of these chakras and circulates around the body vitalising and energising our whole system. Each chakra governs a particular ductless gland or organ and is responsible for maintaining a healthy energy balance in its location. Light from the sun travels to earth in wavelengths. Pure White Light from the sun or Universal Energy contains all the colours of the spectrum. As humans we need a balance of each of these colours to remain healthy. We absorb white light into our system via the chakras and our breath and via the water and food we eat. Each chakra spins and vibrates at a different rate, which also determines their individual colour. As light waves slow down they emit various colours. Colour is determined by its wavelength so the longer the length the denser and slower it becomes. Longer wavelengths are more visible to the human eye and appear warmer. The shorter the wavelength, the finer the colour and less visible to us. Long waves create warm colours and they become cooler as they shorten. This is what creates the colour spectrum (the rainbow) that we are all familiar with. The root chakra spins at the slowest rate and has the longest wavelength. Therefore it has the densest and warmest colour which is red. As we progress upwardly through the chakras, each will spin at a slightly higher speed and vibration than the preceding one emitting its own unique colour on that basis. The Crown chakra has the highest speed and vibration of the shortest wavelength and emits the cool colour of violet. The chakras contain all the colours of the rainbow starting with the longest light wave giving us the colour red, followed by orange, yellow, green, blue, indigo and violet having the shortest wavelength of the colour spectrum. There are other colours but their wavelengths are either so long or so short that we cannot see them. Just because we cannot see them does not mean they do not exist. On one end of the spectrum we have infra-red and the other end ultra-violet for example. There is a belief that as humans evolve the upper chakras will become more highly developed and in time we will be able to see other colours. Maintaining the correct balance of all these colours within us can be challenging at times especially when we experience a lack of natural light and indulge in an unhealthy lifestyle and diet. The seven main chakras are commonly known as the Root or Base, the Sacral, the Solar Plexus, The Heart, the Throat, the Brow and the Crown. Chakras are like spinning wheels of light. When we are healthy these chakras absorb white light in abundance, spin evenly and are bright and clean. We are then considered in a state of balance or healthy in mind body and spirit. The universal life-giving energy has a free, unlimited and unhindered run of our system. When we are ill or effected by trauma, stress, unhappiness or repression, the chakra most directly affected will spin erratically, may become distorted, blocked or even shut down to its natural source of life giving energy. Tears and rips in the chakras can occur as a result of acute trauma. As a result the flow and rate of energy becomes disturbed. This in turn has a knock on effect on the other chakras causing disturbance and irregular functioning as they strive to compensate for the damaged or blocked chakra. A state of unbalance then occurs and with it all the attending feelings of listlessness, tiredness, depression and eventual ill health. The word Aura, comes from the Greek word meaning a breeze. The chakras in turn correspond to the subtle bodies which are layers of energy vibrations that surround the physical body at varying distances. These layers create our personal energy field commonly known as the aura. We all have these energy fields, even animals, plants, rocks and water. Even inanimate objects have their own energy field. These layers of the aura are not rigid. They constantly interact, blend and mingle with the other layers as they feed information to and from each other. The aura also emits and receives vibrations from the environment surrounding us. We can pick up all kinds of external information through our auras. We can sense negative feelings, warmth and joy, sadness etc. We can also sense danger or fear with our aura. Our aura effectively scans our environment as we walk around in it and transmits information to our subconscious that we can choose to act upon or ignore. The aura can be seen by the trained eye to be made up of colours and varying densities. The aura is changing constantly as it reacts to outside influences, our health, how we feel from day to day, our thoughts, both negative and positive, our feelings and our immediate experiences etc. The aura also varies considerably in size. A healthy aura will be bright and bouncy with its layers even. It will expand and contract as necessary. A healthy aura will have no holes or tears and no dull patches. An unhealthy aura will hang close to the body, showing signs of dullness, distortion, tears, holes and dark spots. Each layer of the aura corresponds to a particular chakra. 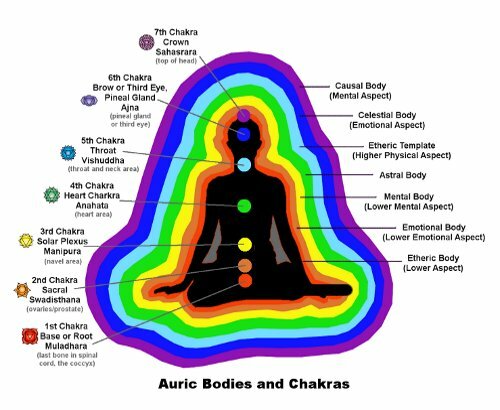 The aura will display any disturbances or blocks in the chakras so a lot of information relating to our state of health can be discovered by reading auras. Stress, trauma and emotional pain can be seen as distortions or blocks in the aura long before they manifest as illness in the physical plane. These layers blend, interact and merge constantly and also penetrate the physical body. Many people can naturally see the aura but with practice and concentration anyone can develop this ability. These subtle bodies or layers of the aura are defined as such. Ether – between state and matter. Lower astral and corresponds with the root chakra. Acting like a template for the physical body, it has the same structure as the physical body including all the bones, muscles and organs. It can be seen as a bluish to greyish white layer and extends an inch to two out from the body. This layer is the easiest for the human eye to see. Illness or disease will manifest here first before eventually penetrating down into the physical body. Energy healers work in the etheric body, breaking down blocks, removing psychic debris and rebalancing the energy field before any disturbance reaches the physical body. Any blocks or disturbances coming from the emotional or mental bodies will arrive here before filtering down to the physical body. The Emotional Body corresponds with the sacral chakra and is associated with feelings. This layer is more fluid than the etheric layer. It can be seen as soft multi-coloured clouds of light visible from one to three inches from the body. This layer displays all the colours of the rainbow. Emotional blocks will be seen in this body as dark or cloudy spots. Golden in colour, The Mental Body corresponds with the solar plexus chakra. It extends three to eight inches from the body and is associated with our thoughts and mental processes. When we concentrate this layer becomes brighter and expands. These three bodies are the lower astral and together are said to make up the personality and are said to begin existence at conception and dissolve or unravel at death. They are connected to and assimilate energy for the physical world. The Astral Body vibrates with multi-coloured layers of light similar to the emotional body but the colour here radiates with a tint of rose reflecting its connection to the heart chakra. This layer corresponds to the heart chakra and it is this chakra and body that connect the lower three layers with the higher three. All healing energy comes through this layer. It is the first of the spiritual layers. It is the gateway to the divine. All energy from the physical must pass through this layer to become spiritual energy and likewise all energy from the spiritual must pass through the heart to become physical energy. It extends six inches to a foot from the body. This Celestial Body is the emotional level of the spirit plane. This is the level we can access by means of meditation. Multi pastel coloured shimmering light. This layer corresponds with the brow chakra. It extends from about two to three feet from the body. This is the mental level of the spiritual plane. It extends about two and a half to three and a half feet from the body. This template contains a grid structure of the whole body and all the chakras and appears as golden or white threads of light. The layer pulses energy down the spine and to all the chakras. The Ketheric Template also contains our life plan and information on our past lives. This layer corresponds with the crown chakra and holds together the form of the aura. It is quite possible that you are already familiar with chakras and auras but may have different names for the subtle bodies. There are various names for the layers of the aura and what name you assign them are determined by where you learned about them or who taught you. There is no right or wrong. Essentially there is a mutual agreement on the nature of each body and its function even if the names happen to differ.